It’s been almost three years since Michael Tse (謝天華) left the station that gave him Laughing Gor, the role that shot the 48-year-old to unprecedented fame in 2009. His last drama with TVB, 2013’s Sniper Standoff <神鎗狙擊>, performed fairly well in ratings; it was an amicable split for Michael and TVB. While many Hong Kong viewers and TVB fans miss seeing “Laughing Sir” on screen, the actor said he wanted to make the most of his “freedom” and try other projects available for him. His success as Laughing Sir in turn gave him only limited options, as he was typecast in stern, crime-fighting roles. After leaving TVB, Michael tackled a variety of different characters in other television dramas. He also went back into singing, and is currently starring in the Chinese survival reality series Survivor Games <跟著貝爾去冒險>, which is hosted by British adventure Bear Grylls, known for his television series, Man vs. Wild. In Survivor Games, which also stars Taiwanese actress Janine Chang (張鈞甯), The Journey of Flower’s <花千骨> Andy Zhang (張丹峰) and more, are sent on a survival trip, where they are to live for a few days with limited supplies. 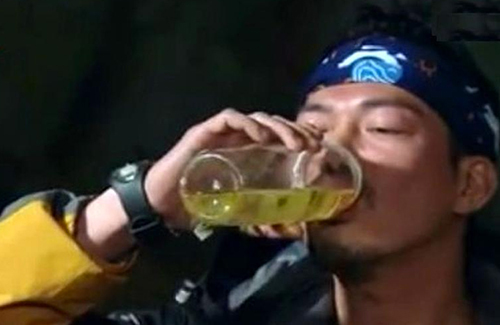 In the final episode, Bear Grylls asked each guest on the show to urinate in a plastic bottle, and then drink their urine the following day. While many artists struggled with the task, Michael appeared relatively calm when he drank his own urine. He drank it all in one setting. So it wasn’t really gator-aid? Yikes. I feel sorry for the girls. Ewwwwwww but at least it’s his own and not someone else!!! Jee! That made me feel so much better about this! LOL! I’ve watch parts of the show. Its horrible. They literally showed each and every the contestants jumping 30 feet into huge lake and making the music sound like its a courageous act that they can handle their fear of jumping into WATER….its lasted like 30 mins watching all the grown adults jumping into water. It was ‘unBEARable’ to watch. Somebody must have leaked out this TVB internal video memos to all its employees warning them what would happen if anyone “badmouthed” the company to the outside world. @stmlw20 Yeah. I watched that episode. And the 3 people are his best friends. He seemed like a clean freak, but lol. Now he drank his own urine??? So he is looking down at tvb, while licking China for the yuan.